What good is G.D.P., anyway? 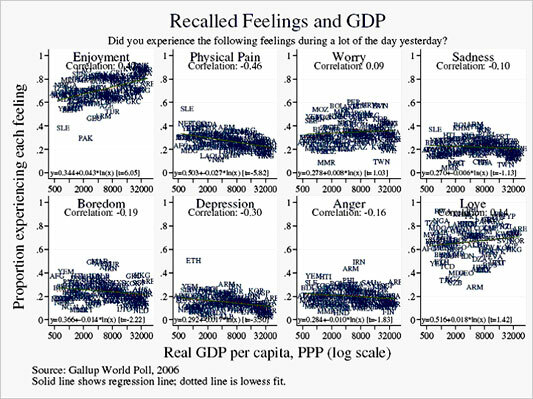 While my postings this week have shown that it is correlated with happiness, I have not spent much time asking just precisely what it is about our subjective experiences that is correlated with higher G.D.P. In fact, the analysis in my previous posts, focused almost exclusively on simple responses to surveys asking people how happy they are, how satisfied they are with their lives, or where they think they are on a satisfaction ladder. The Gallup World Poll asks an amazing battery of questions about the subjectively-experienced lives of people across the globe, and hence offers an unparalleled opportunity to contrast the subjectively-experienced lives of those in rich and poor countries. This chart is my personal favorite, showing the proportion of people in each country who report having smiled or laughed a lot the previous day. 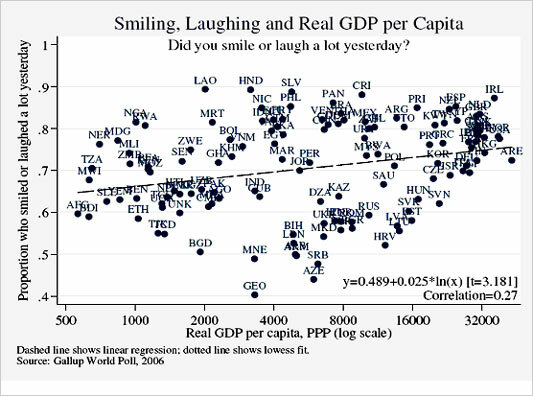 Higher levels of economic development are clearly associated with more smiles and laughter. But equally, there are a lot of exceptions to this rule, and plenty of puzzles. Laotians are more likely to smile than anyone else, and the Irish appear to have earned their national reputation as jolly japesters. My own country, Australia, comes in as the 29th of the 131 countries in the Smile Stakes, while the U.S. is a disappointing 45th. This survey also asks about a range of feelings that might have been experienced the previous day. It is clear that G.D.P. is correlated with more people reporting enjoyment, while those in richer countries are less likely to report experiencing physical pain, depression, boredom, and anger. Interestingly, G.D.P. appears uncorrelated with feelings of worry. And as I mentioned last Valentine’s Day, love is very democratic; it is as likely to be experienced in rich as poor countries. It is also interesting to note some of the experiences that were reported in rich and poor countries. Perhaps it is unsurprising that those in rich countries are more likely to report having eaten tasty food. But I was also interested to learn that people in rich countries are more likely to report having been treated with respect, or having autonomy about how to choose their time. Equally, many of these reports — including things like feeling well-rested, or having pride in one’s recent achievements — are surprisingly unrelated to economic development. My recent research paper with Betsey Stevenson only scratches the surface of what we can learn from these data. But I am confident that over the next few years, the social science community is going to learn a lot more about the relationship between our current objective (and primarily economic) measures of living conditions, and the subjectively-experienced lives of people all around the world. Let the interdisciplinary research teams loose: there’s a lot here for economists, psychologists, sociologists, anthropologists, and political scientists to better understand. This is a pretty interesting data set and there does seem to be a lot of potential in it for further research. However, I do wonder whether translation issues come into play when trying to ask the same question in dozens of different countries. Presumably even those of us who are not multilingual have had at least a small amount of training in a foreign language. As you may have noticed, there are plenty of ideas that don't translate neatly from one language to another. Even really simple words and phrases can pick up unintended connotations. This isn't meant to be an indictment of the people at Gallup - I don't know anything about them. I just think it's something we should consider very carefully when comparing these data across linguistic borders. Here's my question. Is there any cross country self-reported data on "How financially well-off do you consider yourself?" (say on a 1 to 10 scale). I guess my question would be how correlated this question would be to happiness. My sense is that the reason you find an income effect with 'happiness' is because many people (and apparently countries) consider financial well-being and happiness to be the same thing. Secondly, I wonder about cause and effect. Does increasing happiness predict increasing wealth or GDP or does increasing wealth produce increasing happiness. Did you do some sort of lagged time series to get at this question? Is this data available publicly? It could be fun to look at it. You could upload it somewhere for us to play with, like infochimps or swivel. It would be interesting to see how people who have migrated from poor countries to richer ones rate their change in happiness. 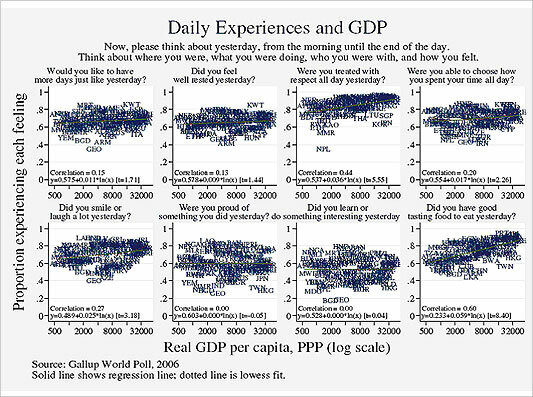 I think that asking someone who has experienced both will give a good picture of the correlation between happiness and GDP per head. Just a little comment to tell you I enjoy reading your blog. The effect size seems at least as important as the t-statistic here. For instance, in the example of laughing/smiling chosen by the author, multiplying a country's average real income by 10 (a huge jump!) leads to just under a 6% increase in the number of citizens who laughed or smiled a lot. This is obviously dwarfed by cultural norms and (although not seen in this data) individual personality differences. Which is not to say we shouldn't care about GDP, and if verified it does suggest that Easterlin wasn't quite right. But my guess is that people's intuition would have been that the effect of money on happiness is much larger than that, so this new data seems to actually confirm the basic surprise that they're not particularly closely linked at all. In terms of policy, it may be hard to change cultural norms and personalities. But it's undeniably hard to multiply a country's GDP per capita by 10. In any case, I liked the paper and do think this is an important / interesting topic for economists to be looking at. You can regress a line through any set of data, but that regression doesn't change the fact that your data is largely snowstorms. The corellation coefficients are for the most part very low. Even where there is a significant corellation, clearly most of the variance in the data cannot be ascribed to GDP. The only conclusion I think is justified here is the profound lack of corellation between the various feelings and experiences, and GDP. To do otherwise is to committ bad statistics. These have to be some of the worst possible graphic presentations of possibly interesting(but who knows?)data. Utterly unreadable! This seems to be a series of answers in search of a question. As a 'layperson', I can't understand for the life of me why "GDP" is always supposed to = "good". GDP increases whether the things produced or contracted for are good, bad or indifferent. If I buy a grocery item where I live (in Italy) and the store person wraps it in a simple piece of paper, I'm happy *at the expense of GDP*. In the US the same item might come wrapped in several levels of plastic, cardboard and styrofoam (which is "better" for GDP!) then I have to throw that junk away (which is good for GDP -- the garbage truck and the diesel fuel and the landfill all "create" positive GDP). Since here I walk to the store rather than drive, that's also "bad" for Italy's GDP! The war in Iraq is positive for US GDP. GDP alone as a measure of well-being is a crock, a red herring. But go ahead.. spend years and years of costly education and millions of man-hours studying it, and reams of paper and billions of electrons debating that which anyone can see right in front of them. Sheesh! Looks a lot like a Rorschach test to me. Been following this thread for a while and it looks to me like these are very small effects that are quite likely to be spurious. That is, the effects account for only about 5% of the variance, they don't show up in all the dependant measures that you would predict they should and there are MANY variables that weren't entered into the regression. Although there MAY be an economic effect of overall happiness, it has not been demonstrated here. Subjective well-being measured against GDP per capita is probably less revealing than if you were to measure it against the growth rate of GDP per capita, adjusted for changes in income inequality. I would imagine the correlations would be stronger in that case. « Previous PostAre Distinctively African-American Names a Thing of the Past? Next Post »Does Climate Change Mean More Witch Hunts?